Ghouls will see you coming from a mile away in these Converse kicks. But who cares – they’re totally awesome! The shoelaces and artwork glows in the dark which makes them ideal for night walks if you’re not afraid of getting devoured. Just like the Titans, these t-shirts only come alive during the daylight! This line of abstract fashion tees with a special solar activated ink, allows wearers to transform into Titans by day and revert back to their normal Otaku selves by night. Add a splash of color to your wardrobe with any of these epic Splatoon leggings. They come in many prints, dazzling colors and are available in all sizes which creates the perfect attire for any Splatoon crazed fanatic! 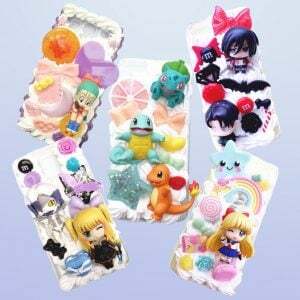 Choose from your favorite anime characters and surround them with a combination of pretty stars, bows, hearts and sweets to create a super kawaii phone case. The possibilities are endless with results that are out of this world! Stay battle ready with one of the many Keyblades found in the Kingdom Hearts games. Both Sora’s Silver and Mickey’s Golden Kingdom Key’s come in a fashionably detailed necklace which will catch the light as it jiggles around your neck.